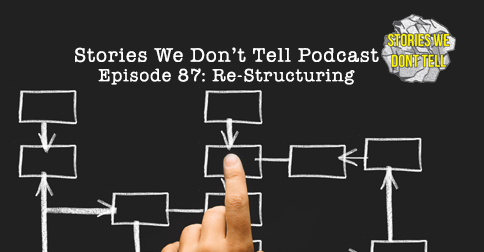 This is a transcription of Stories We Don't Tell Podcast Episode 87: Re-Structuring. Listen to the podcast episode HERE. Alright, Five in Five: After Dark. I just feel like we need to still include editing in here somewhere. There's a requirement especially since it’s so hard and a lot of people don’t do it. I actually think that perhaps the most common fault of new storytellers is they cannot accept that they have to cut things. You don't have to say everything and every word isn't precious. I'm biased because editing is so important to me. I wonder if there are two kinds of people in this world. People that like to edit and people that don't like to edit. I like to edit and sometimes it’s even down to the actual show and I’m still changing words that I think may sound better. Also, some people think everything matters. When a story is too long, people will start tuning out. I think part of the reason is that people are bad at structuring their stories. It's sometimes not a case of editing specifically, just revising parts that you need to restructure. That brings up a good point and I think we've been hinting at it all along - editing and structure. There are different kinds of editing. You write it all out and you're able to take out chunks. Then there’s the kind of editing where you are fine tuning it and tightening it up. That's where you're looking at your structure. I'm fascinated with the concept of editing because there are so many different layers. Sometimes you can just trim here and trim there. There are some writers who use a lot of words in which case the editing is going to probably be line by line cutting out little pieces. While others need to be mindful of the overall structure. Edit and then edit some more. To wrap up, write it all out but don’t get lost in the story, pick a moment that represents a larger theme, cut out all the boring parts and edit, edit, edit!